It would have been a devastating blow to American morale. Had the Taliban or insurgents slipped a truck bomb onto Camp Leatherneck in southern Afghanistan just months after President Barack Obama ordered a troop surge at the end of 2009, the enemy would have won a public relations coup – not to mention the possibility of taking American lives and wounding an untold number of military personnel. Lori Reynolds, a 1982 graduate of Seton High School in Baltimore, knew the stakes. 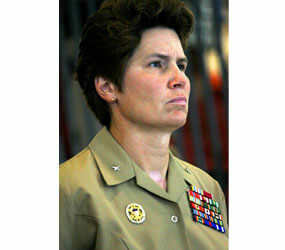 Then a colonel with more than two decades experience in the Marines, Reynolds became the base’s commanding officer in March 2010 – the first woman Marine to hold a command position in a battle zone. As Camp Leatherneck was being transformed from a remote, 6,000-person military camp into a bustling center for 20,000 Marines, Reynolds was responsible for its day-to-day operations. Security was constantly on her mind as she essentially acted as mayor of a small city that had 240 trucks on camp at any given time. “It’s what kept me awake at night,” Reynolds said. Although the threat was real, there was never an attack on Leatherneck during Reynolds’ yearlong deployment. “I claim it as a success,” said Reynolds, who is quick to credit the skill of American fighting men and women and support from Bahrain police who helped protect the camp’s main entry point. More than a year after Reynolds broke new ground in Afghanistan, she is again making history. Now a one-star brigadier general, Reynolds became the first woman to run the storied training depot at Parris Island, S.C., June 17. Approximately 20,000 Marines graduate from Parris Island every year, including all female recruits. Reynolds also commands the Marines’ Eastern Recruiting Region, which encompasses 23 states east of the Mississippi River. Her life is the Marines. Growing up in Northeast Baltimore, Reynolds was a parishioner of Most Precious Blood. She attended the parish school, serving as student body president when she was in eighth grade. Her parents were active in parish life, with her mother leading the Parent-Teacher Association. “The social life was the church,” remembered Reynolds, who played softball and soccer at Most Precious Blood. At Seton, Reynolds said the Daughters of Charity were “hard on us” and had high expectations. Catholic education provided an advantage, Reynolds said, precisely because of its sense of accountability. It was values-based and promoted discipline, she said. Reynolds set her sights on the Marines after visiting the Naval Academy in Annapolis. She longed to “get out and see a little of the world,” she said. Reynolds became one of the first women to attend the academy, an achievement that was not without challenge. While the institution was supportive, she said, not everyone in class believed women should be there. Reynolds doesn’t draw attention to the lines in the sand she has crossed. During her speech to Marines during a change of command ceremony at Parris Island, she made no reference to being the first woman to lead the historic training depot. Reynolds simply asserts today that the “there has been a certain reality that there is a role for women in the military.” She cited her experience in Afghanistan, noting that women are needed to speak with Afghan women. “It’s a security issue,” she said. Trained as a communications officer, Reynolds commanded the Marine Recruiting Station in Harrisburg, Pa., from 1997 to 2000. She commanded the Ninth Communication Battalion and deployed to Fallujah, Iraq, in support of Operation Iraqi Freedom II from February 2004 to March 2005. She was also a division chief at Marine headquarters in Washington, D.C., and a commander at Camp Pendleton, Calif., before going to Afghanistan. Parris Island is attracting the “highest-quality” recruits seen in a “long time,” Reynolds said. The Marines rely on “values-based” training that encourages good decision making, she said. Reynolds said she is humbled by young men and women who are willing to give their lives for their country. At Parris Island, long known for its rigorous training regimen, young people are transformed into some of the finest fighting forces in the world.